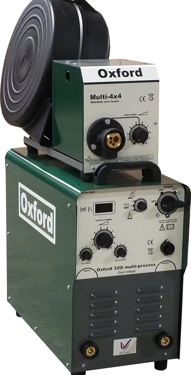 The MULTI-ARC portable range are a real 'go anywhere weld anything machine'. Buy the power source alone & you have a powerful MMA ARC welder, add a MIG wire feeder & you get a very capable MIG welding machine with superb performance, add a TIG torch & it becomes a TIG machine. These models are based around highly acclaimed CUTMAKER PLASMA machines. This is our Oxford Hybrid technology which uses a copper wound transformer & Mitsubishi PWM chopper technology to give infinite & precise electronic control of the output. Chopper based welding machines have been around for a few years but only on the biggest most industrial equipment, we have changed all that. The benefits of this chopper technology should not be underestimated, you get performance & efficiency comparable to a good inverter based machine but with the ruggedness, reliability & lifespan of a conventional machine. Whilst maybe not quite as light as an inverter the other benefits far outweigh. These machines weld as well as the very best German made inverters yet tolerate real world conditions such as grinding dust, moisture, knocks & drops & overvoltage spikes on the supply without problems therefore you can many times the lifespan of European or American made inverters & without the big expensive repair bills associated with complex inverter machines! Ideal for all welding applications, they are equally happy working outside in the rain, in the back of a van or in your workshop. Everything from repair & maintenance to industrial fabrication work. Dual voltage, connect to single phase or three phase supply. True multi-process CC/CV output with infinite control of welding power. MMA arc welding function welds all rods including cellulosic 6010 etc. MMA anti stick circuit cuts the power if the rod becomes stuck. MMA arc force control to give a more forceful arc if needed. TIG welding with lift arc, welds steel, Stainless, even thin aluminium. MIG welding from 15A upwards with super smooth arc & variable inductance to fine tune the arc characteristics. MIG welding with reverse polarity gas less wire. MIG arc start circuit built in to start the weld fast & clean without ‘machine gunning’ when you pull the trigger. Digital meter shows output amps for easy setting & for BS EN1090 etc. Very simple to set up & use, anyone can use it in seconds. Built in automatic compensation for varying supply & long cables. Dual voltage input 230/400V, (even works up to 160A on a 13A plug). Generator friendly design (no blow up on unstable generators!). Very efficient design to minimise power consumption & give you more output for less input power. Suitable for use inside or outside (site welding etc) (IP23S rating). 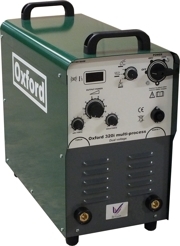 MMA ARC welding - Buy just the power source & you have a powerful ARC welding machine. The high OCV & built in hot start guarantees fast arc up & the welding is super smooth & spatter free from the thinnest sheet metal right up to heavy profiles. Built in anti-stick cuts the current in the event of a short down to prevent the electrode annealing & allow it to free off easily. All electrodes can be used even cellulosic rods which most machines will not touch! MIG welding - Add a wire feeder & you get exceptional arc characteristics on steel, stainless steel & aluminium. The weld is really smooth & consistent with minimal spatter & can be used for welding anything from car body panels at 15A up to structural steel work. The welding power is infinitely adjustable on the front of the power source so you can get the exact setting needed for any job. The standard Oxford wire feeder is either 2 roll or 4 roll wire drive and can be supplied with almost any length interconnecting lead up to 20M. Its also possible to run an arc voltage wire feeder from this machine which only uses the welding cable connections which can be any length up to 100M. The output polarity can be easily changed to allow self shielding gasless MIG welding. MIG welding performance is superior to a standard step voltage MIG on all materials. Variable inductance control allows you to tune the arc to suit your requirements, this is used to minimise spatter and to control the arc from crisp through to soft. Lower inductance is used with thin wires for a crisp stable arc with maximum deposition & minimum heat into the work, increasing inductance softens the arc, reduces spatter & increases heating of the work. Built in arc start circuitry gives easier starting every time you press the trigger this is designed to stop ‘machine gunning’ at the start, this is particularly advantageous on aluminium welding as it stops the ‘pop’ & subsequent burnback which is the problem associated with MIG welding aluminium. We also offer a spool gun & push pull gun to fit. DC TIG welding - fit a TIG torch & you have with true lift arc start so your electrodes last well. This is ideal for stainless steel, mild steel, copper etc & can even be used reverse polarity for TIG welding thin aluminium up to 2-3mm. The arc is super smooth right through the range & can be used for welding metal from 0.5mm thick. * 220 is available as 400/230 dual or 230/110V dual, please state at time of order * Min generator rating is for up to 75% output power, for full welding power we suggest increase KVA rating by 40% Power source size (all models) 260mm W x 520mm L x 420mm H (excludes exterior hardware) All ratings above are based on TIG welding, when using on MMA or MIG duty cycles reduce by 15% & input power increases a little. Compliance with with BS EN60974-1, BS EN 60974-10, RoHS, weee registered & CE marked.